Observational studies on long-term endocrine treatment among breast cancer patients have presented discontinuation rates on tamoxifen, but lack information on the continuance of any endocrine treatment [both tamoxifen and aromatase inhibitors (AIs)] within the same cohort. In this study we determined switching rates from tamoxifen to AIs, discontinuation rates of tamoxifen only, discontinuation rates of any endocrine treatment and determinants of first treatment switch and treatment discontinuation. 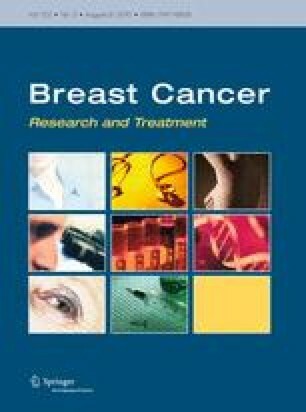 Patients with early stage breast cancer (stage I–IIIa) starting on tamoxifen were selected from the linked Eindhoven Cancer Registry-PHARMO RLS cohort in the period 1998–2006. Continuous use (allowing a 60 days gap between refills) of tamoxifen only and any endocrine treatment were determined after various follow-up periods: 1, 2, 3, 4, and 5 years. Time to first switch from tamoxifen to an AI was assessed. Cox regression was used to identify determinants of first treatment switch, discontinuation of tamoxifen, and discontinuation of any endocrine treatment. A total of 1,451 new early stage breast cancer patients started on tamoxifen. Of those, 380 had a treatment switch to an AI during follow-up. Of the patients followed for 5 years, 40% continuously used tamoxifen, which was 49% for any endocrine treatment. Older age (older than 70 versus 50–69 years) was independently associated with increased discontinuation of tamoxifen and any endocrine therapy. Patients with two or more concomitant diseases (versus no comorbidity) showed an increased likelihood to stop any endocrine treatment or switch treatment from tamoxifen to an AI. In conclusion, up to half of the breast cancer patients starting tamoxifen continued 5 years of endocrine treatment. Identification of patients at risk of discontinuation will assist in the development of interventions to improve treatment continuation comparable to that of patients included in clinical trials. This study was performed as part of the Ph.D. programme of Mrs. M. P. P. van Herk-Sukel. This work was partially supported by the Netherlands organization for health research and development (ZonMw 80-82500-98-8227). No conflict of interest declared for the authors Dr. L. V. van de Poll-Franse, Dr. A. C. Voogd, Dr. G. A. P. Nieuwenhuijzen, Prof. Dr. J. W. W. Coebergh. Mrs. M. P. P. van Herk-Sukel and Dr. R. M. C. Herings are employees of the PHARMO Institute for Drug Outcomes Research. This research institute performs financially supported studies for several pharmaceutical companies.